The Portrait Magazine: 2017 "Global 30"
P: Your friend James Lee Byars believed, that to arrive at a satisfactory plateau of knowledge it was pure folly to go to Widener Library at Harvard and read six million books. Instead, he planned to lock the 100 most brilliant minds in the world in a room and have them ask one another the questions they'd been asking themselves. The expected result—in theory—was to be a synthesis of all thought. But it didn't work out that way. Byars did identify his 100 most brilliant minds and phoned each of them. The result: 70 hung up on him. You created the website Edge.org which is very similar to Byars’s idea. Why did you succeed? B: I had gotten to know the founders of the major internet companies when they were starting out and before they became successful. The founders of Amazon, Apple, Facebook, Google, Microsoft, Twitter, Tesla, have all attended my annual "Billionaires' Dinner." I am, according to software visionary and father of hypertext Ted Nelson, "the shadowy figure at the top of the cyber-food chain." P: What’s your standard for selecting brilliant minds? And how do you verify that your choices are authoritative? B: "To accomplish the extraordinary, you must seek extraordinary people." At the center of every Edge project are remarkable people and remarkable minds—scientists, artists, philosophers, technologists and entrepreneurs who are at the center of today's intellectual, technological, and scientific landscape. They are representative of the “third culture” the subject of my 1991 essay "The Emerging Third Culture," and the subsequent 1995 book, The Third Culture: Beyond the Scientific Revolution. The Edge website he founded has been called the smartest website in the world. He has gathered more than 2000 of the smartest minds in the world to confront each other in the forums, and any great, interesting, controversial ideas can be discussed here. He’s posted an annual question every year, inviting members of the site to answer. The annual question asked in 2017 was, "What scientific term or concept ought to be more widely known?" The third culture was a large enough umbrella to also include the "digerati," the doers, thinkers, and writers, connected in ways they may not even appreciate, who, by 1991, already had tremendous influence on the emerging communication revolution surrounding the growth of the Internet and the Web. My role in that world is based on showing up early, and being in the right place at the right time. P: How do you find these brilliant minds and persuade them to join Edge? B: First, I am predisposed to endless curiosity. Second, I found out at the early age of 25 that passionate curiosity and intellectual hunger from a young person are always welcome by even the most established, revered thinkers in the world. I picked up the phone, called anyone and everyone who interested me and introduced myself. I probably benefited from the fact that I was very much in the news thanks to my work in New York's avant-garde art world. But I don’t recall a single individual who did not meet and talk to me. Third, I had the following epiphany: my friends and I were at ground zero in the invention of a new cultural world. We were, in our 20s, already historical figures. And that realization changed the way I looked at the world. On arriving in New York at age 23, after receiving my army discharge, I set up a financial leasing company by day, but by night I went downtown to the avant-garde Theatre Genesis where I volunteered to help set up the theatre. At Theatre Genesis, still wearing my 3-piece business suit, I worked side by side with the young 21-year-old playwright Sam Shepard, recently arrived from the West, and Sam's roommate, Charlie Mingus, Jr. I soon moved to the Film-Maker’s Cinematheque where the legendary founder Jonas Mekas hired me to organize and produce "New Cinema I," which came to be known as "The Expanded Cinema Festival." The mandate was to produce a festival of nightly events by painters, sculptors, poets, dancers, video artists, and ask them to incorporate cinema into their work. I had the unique opportunity to work closely with the video artist Nam June Paik, with the painter/sculptors Andy Warhol, Robert Rauschenberg and Claes Oldenburg. I got to meet Miró, Chagall, Man Ray during this period. The following year, while working at the Lincoln Center for the New York Film Festival, I went to a dorm room at NYU to screen a movie by Martin Scorsese, a 19-year-old student film-maker. This led to his first public screening at the Festival, the same program that included visiting film-makers Jean-Luc Godard, Federico Fellini, and Milos Forman. P: How many people are members of Edge? Are any Chinese? B: We don't have a formal membership. We do have the private Edge mail list of about 2000 people, and about 800 "Edgies" have contributed essays and comments to the website. China can claim 3 contributors of outstanding merit: Mathematician Shing-Tung Yau, born in Shantou, Guangdong Province, is a tenured professor of Harvard University. He has won many prizes in the field of mathematics and is one of the greatest scientists in the world; Educator Luyen Chou, who was born in the United States, is a senior vice president of Pearson, a global publishing company. Entrepreneur Kai-Fu Lee, a prominent AI researcher in the 1980s, and now a Beijing-based venture capitalist, was recently ranked #1 among the leaders of China’s A.I. revolution by Forbes magazine. P: How often do you get together? Offline or online? What do you usually talk about? B: Edge has a regular online publication schedule, 2 or 3 original pieces a month, which are exclusively published on edge.org. For many years we have published a major event, the Edge Annual Question, which has received international attention in mainstream media throughout the world. P: The annual question of 2017 is “What scientific term or concept ought to be more widely known?” Why did you choose this question? B: Richard Dawkins' “meme” became a meme, known far beyond the scientific conversation in which it was coined. It’s one of a handful of scientific ideas that have entered the general culture, helping to clarify and inspire. This question recognizes that there were many terms that clarify and inspire serious thinking. On the other hand, not everyone likes the idea of spreading scientific understanding. Remember what the Bishop of Birmingham’s wife is reputed to have said about Darwin’s claim that human beings are descended from monkeys: "My dear, let us hope it is not true, but, if it is true, let us hope it will not become generally known." P: What’s your answer about this question? B: I have no answers. The question is the answer. Or, a better way of putting this: I am the guy who stands at the back of the theatre and turns the lights on and off. P: What have you learned from this particular question? B: Some of the most interesting topics included: Mysterianism (Nicholas G. Carr), Confirmation Bias (Brian Eno), Affordances (Daniel C. Dennett), Common Sense (Jared Diamond), Deliberate Ignorance (Gerd Gigerenzer), Intellectual Honesty (Sam Harris), The Neural Code (John Horgan), Neurodiversity (Joi Ito), The Anthropocene (Jennifer Jacquet), Premature Optimization (Kevin Kelly), Naïve Realism (Matthew D. Lieberman), Navier-Stokes Equations (Ian McEwan), The Second Law of Thermodynamics (Steven Pinker), Effective Theory (Lisa Randall), Haldane's Rule of the Right Size (Paul Saffo), Epsilon (Victoria Stodden), Coalitional Instincts (John Tooby), Embodied Thinking (Barbara Tversky). P: Edge is called “the world's smartest website.” Why? B: The headline “the world's smartest website” was written by Cambridge University communications theorist John Naughton in the 2012 profile he wrote for The Sunday Guardian/Observer: “The Man Who Runs the World’s Smartest Website.” I would not make that kind of claim myself, not out of false modesty, but because it raises serious questions about the nature of intelligence and not being a scientist, I would look to qualified people for the answers. Some in the media would snarl at the headline, particularly those great minds of the 1950s crowd still around and stuck in the world of Freud, Marx, and Modernism, but the world has moved on. I am confident that no other publication comes close to the originality and authority that Edge brings to the questions are driving our times. P: Edge has been established for 20 years, do you have any “confusion”? Or is there any problem that confuses you all the time? B: “Confusion,” as you put it, accounts for about one third of the pounding in my brain. "Awkwardness," "Confusion," "Contradiction," are my three best friends. To get anywhere, go beyond the useless tropes ­­of the new business class such as "disrupt! "; “be bold, risk failure.” Go further: risk everything. Be willing to go all the way: play the fool. P: Your books are published in China. Some readers say that every article is short, many issues are generalities, not deeper thoughts. It seems like quick knowledge. What do you think about this? B: Your readers have a point, but then, either because of language differences, or lack of access to the US-based edge.org website, your readers don't have the opportunity to read the online version of edge.org. In the US, the complaint is just the opposite: “why are the pieces so long?” We regularly publish features that are 5,000 to 8,000 words. Our 2017 Annual Question has 206 contributors whose contributions resulted in a text file of 158,000 words. Our special seminars and events have run as long as 60,000 words. The Edge Question, published once a year, is a high point for the year, but it's a side show to the regular Edge program which, by the way, also includes book versions of collected essays organized by subject: “Life,” “Universe,” “Culture,” etc. These volumes all consist of long form pieces only. P: You mentioned that Edge is not a publication written for the general public. The audience for the contributors to Edge are the other contributors. Why? B: I first arrived in New York in 1961 at age 20 for graduate school at Columbia University. I was immediately struck by, and impressed with, the argumentative and exciting culture in which conversations were being carried out month after month in the pages of literary magazines such as Commentary, Partisan Review and the UK's Encounter. For a dollar or two, I was privileged to look over the shoulders of the intelligentsia of the day—Lionel Trilling, Stephen Spender, Hannah Arendt, Alfred Kazin, et al—as they went at one another, arguing over important issues such as the Eichmann trial and/or more trivial pursuits as to who slept with whom on a particular Bloomsbury weekend, or who still remained a Stalinist after the purge trials of 1937. This crowd, the "second culture," was run by the book critics who, in the 1920s, hijacked the word “intellectual.” They've gradually faded away, diminished to the point of irrelevancy. The center of action is now the third culture intellectuals who are asking the important speculative questions that represent the frontiers of knowledge in the areas of evolutionary biology, genetics, computer science, neurophysiology, psychology, and physics. We ask them to write for subtle people, not for the world. Lines that are too easy can't attract complexity. P: You have been doing this for 20 years. Has this kind of form changed your way of thinking? If changed, does is lead to deeper or shallower thinking? B: One thing I’ve learned is that it doesn’t get easier to come up with a question. As James Lee Byars used to say: "I can answer the question, but am I bright enough to ask it?" Edge is a conversation. We are looking for questions that inspire answers we can't possibly predict. Surprise me with an answer I never could have guessed. My goal is to provoke people into thinking thoughts that they normally might not have. The art of a good question is to find a balance between abstraction and the personal, to ask a question that has many answers, or at least one for which you don't know the answer. It's a question distant enough to encourage abstractions and not so specific that it's about breakfast. A good question encourages answers that are grounded in experience but bigger than that experience alone. P: How would you characterize the mental state of this era? Is the gap between the elites and the masses widening? P: Considering your life experience up to now, what’s your most important life suggestion? B: Dare to be great! 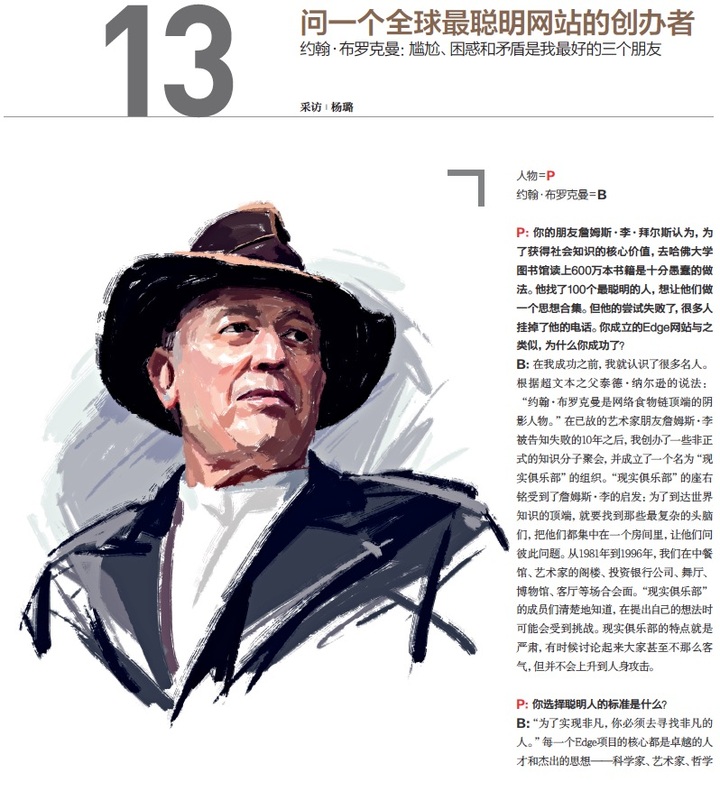 First printed in Chinese by Portrait Magazine, January 2018.